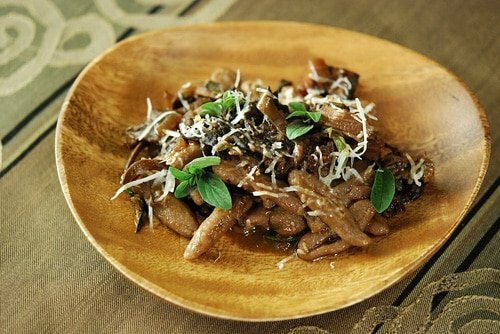 There are endless permutations of the mushroom pasta sauce, from those using workaday white button mushrooms to fancy versions with expensive porcini and matsutake mushrooms. Lots of choices in ingredients, too: tomatoes or no? Red wine or white? Vegetarian or with meat? In this case, I have made a red wine mushroom ragu — basically a thick, chunky pasta sauce — with big pieces of homemade bacon in it. I designed this sauce to go with homemade cavatelli made with acorn flour. Cavatelli are a little like dumplings in that that are light yet substantial and chewy. I chose acorn flour because I like the forest motif with the wild mushrooms. (Click for my acorn flour pasta recipe.) You should use something similar, like gemelli, Sardinian malloreddus, orecchiette, casarecci or some other thick, short pasta. Farfalle (bowties) work in a pinch. If you can get them in whole wheat even better. This ragu is also an excellent use for dried mushrooms. Can you use fresh? You bet, but half the flavor in this recipe is from the soaking water from the dried ‘shrooms. And, like most sauces, this one is better the second (or even third) day. So make a lot and reheat it for leftovers. About 2-3 ounces of dried mushrooms: Porcini, morels, chanterelles, black trumpets, matsutake, maitake, oyster, etc. Soak the mushrooms in a large bowl with hot tap water. Cover to keep them submerged. They will need at least 30 minutes and up to several hours depending on how large and how old the mushrooms are. Remove the mushrooms once they’ve rehydrated and rinse them. Put them in a tea towel and wrap them up. Squeeze the mushrooms dry and set aside. Strain the mushroom soaking water through a fine sieve with cheesecloth set inside. Do this slowly, and discard the final few tablespoons of liquid, which will be full of bits. You want to remove all grit. In a Dutch oven or other large pot with a lid, heat the duck fat or butter over medium heat. Add the bacon and fry gently until crispy. Remove the bacon and add the onions, turning the heat to medium-high. Stir and cook until they begin to brown. Add the garlic and the mushrooms and stir well. Cook 3-4 minutes, stirring often, until you begin to see the garlic start to brown. Add back the bacon and the tomato paste and stir well. Cook one minute. Pour in the red wine and add the oregano. Stir well and bring to a strong boil. Let this cook down for 5 minutes. Add the mushroom liquid up to the level of the mushrooms. You don’t want a soup, but think of a loose stew. Taste for salt and add if needed. Let this simmer — not boil — simmer until the liquid reduces and it begins to tighten up. This could take 20 minutes. Cover and turn the heat to low. Cook for 1 hour. Get your water ready for pasta and boil some. When you are ready to serve, mix some ragu in with the drained pasta and top with some more sauce. Garnish with chopped fresh oregano, fresh ground black pepper and grated cheese, such as parmesan or pecorino. I made this for dinner with maitakes and some home cured guanciale… absolutely fantastic. I am making up a few quarts more to freeze. I’m thinking it will be great over my paglia e fieno fettucine (nettles and semolina). Thanks! !